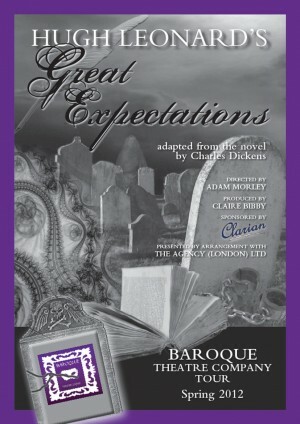 Baroque Theatre Company presents 'Great Expectations', a stunning theatrical experience, in celebration of the 200th anniversary of Charles Dickens’s birth. Young Philip Pirrip, known as “Pip”, helps the escaped convict Abel Magwitch and sets in motion a train of events that will affect his entire young life. Taken under the wing of the eccentric Miss Havisham, Pip falls in love with her ward, the chilly Estella, and determines to be a gentleman. Receiving money from a mysterious source, and expecting more, Pip renounces his humble past life and feels sure he will achieve his aim – and then the true identity of his benefactor is revealed and a painful process of moral education begins for Pip. Bringing to life all the vivid characters of the original and conveying the story with great clarity, atmosphere and theatrical flair, this production of Charles Dickens’s most popular novel will be exciting and haunting.